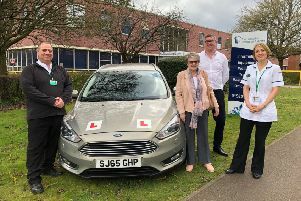 ‘Getting it Right First Time’ has been piloted successfully and will now be implemented across the country, with Leighton Buzzard a priority area. It will see ideas of best practice from impressively-performing surgeries shared with Leighton Buzzard, an action plan produced and progress closely monitored and reviewed early on. Following South West Beds MP Andrew Selous’s question to the Prime Minister on Wednesday about speeding up the roll out of the General Practice ‘Getting it Right First Time’ programme, the national director of Clinical Improvement for NHS England and the chairman of ‘Getting it Right First Time’, Professor Tim Briggs, has said that Leighton Buzzard GP surgeries will be at the forefront of the new initiative and has visited Leighton Road Surgery recently. Mr Briggs, the originator of the programme, hails from Toddington and his father was a Leighton Buzzard GP. Earlier this month, the LBO reported how staff at Leighton Road Surgery have been dealing with a “tirade” of abuse due to mounting tension at the difficulty in securing GP appointments, with patients complaining that the phone lines are frequently gridlocked and that callers get cut off whilst on hold. Any improvements to the situation would undoubtedly be welcomed and Mr Selous said the scheme was all about getting insights into which surgeries were doing well nationally and translating that into a detailed plan on how local surgeries can get to that standard. He said: "GP surgeries are quite varied in terms of quality around the country. There are some good and outstanding surgeries and they are on the same funding. We need to try to spread best practice and watch progress. "This could then be an upward spiral for Leighton Buzzard. There's no reason we can't have a plan to make all surgeries in town outstanding." He added: “Professor Briggs and I worked for over 8 years to get the NHS to bring in the ‘Getting it Right First Time’ programme. “It was originally brought in for Orthopaedics and now has extended to over 30 different medical specialisms and most recently General Practice. "The pilot phase of ‘Getting it Right First Time’ for General Practice has now been concluded and Professor Briggs, who has already visited Leighton Road Surgery at my request has agreed to come back to Leighton Buzzard to assist the GPs in the town with the roll out of ‘Getting it Right First Time’ for GPs. “As a member of the Health and Social Care Select Committee I visited Larwood House in Worksop which is an outstanding practice and I also made reference to similarly outstanding practices in Whitstable and Peterborough. "At Larwood House everyone who wants to see a doctor gets to see one that day. They have a very big team of people there - pharmacists, physiotherapists, for example - and people are really happy with it. The practice in Whitstable, it's been suggested that Leighton Road Surgery go and visit it." But he pointed out that the hundreds of missed appointments every month in Leighton Buzzard were an unnecessary burden. "Did Not Attends are not acceptable," he said. "Yes, there needs to be accountability and an action plan for the surgeries but I challenge all patients to treat their doctors' surgery with respect. If you can't make it, tell them. There's also no excuse for shouting at reception staff. "We need more GPs. There have been record numbers of new GPs in the last two year, but they are not staying. They are coming through in their numbers but the issue is retention. We've got to make the job enjoyable. Can we get them out of retirement too?"